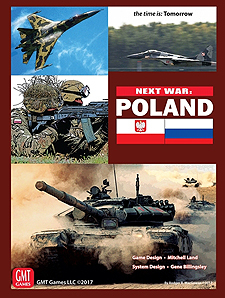 Next War: Poland, is the fourth volume in the Next War Series. This game moves the action from Asia to Europe and allows players to fight a near future war in Poland as the Russians and their allies invade and NATO responds. A large portion of Poland is represented by the Operational (hex) map, while the Baltics are represented by a Strategic Display (similar to Next War: Taiwan's). The Russians are not the behemoth of the Cold War, but they possess good material and a much better trained army than before. The Baltics, using new rules and mechanics, may fall quickly, although their forces may put up some resistance and make an appearance as reinforcements, while the front quickly establishes itself in eastern Poland as the Russian 6th and 20th Armies push forward to seal the Suwalki Gap while NATO rushes forces into the area spearheaded by the Allied Rapid Reaction Corps and followed up by whatever nation's troops respond to the Article 5 declaration. The question is, can NATO stop the Russians or will Poland be overrun while Russia presents the world with a fait accompli? Weather Determination. Bad weather can severely hamper air and naval operations and can significantly slow ground operations. Special Operations Phases in the Advanced Game allowing players to utilise their special operators in various recon and raid missions behind enemy lines. One or more Movement and Combat Phases that allow both sides to move, react, and fight, with an advantage to the Initiative player on non-Contested turns. Combat resolution examines not only unit strengths but also efficiency (representing training, doctrine, and morale), as well as the terrain where the combat takes place. The CRT tends to be very bloody in nature, reflecting what we believe will be a degree of attritional warfare early due to the lethality of modern weapons. As in many games, casualties represent not only actual combat losses, but also losses of unit cohesion brought about by the rapid pace with which modern armies are able to engage and exploit on the battlefield.